When you walk into this place you get the feeling that it was great. If you take it slowly you can appreciate Arab, Jewish and Christian craftsmanship in a harmony that makes you reflect on tolerance and respect between different cultures and religions. In particular, the Patio de las Doncellas (courtyard of the maidens) is a gem to discover. One of my favourite places in Seville for the peace it breaths walking in the gardens. It is delightful in spring and refreshing in summer. You just have to see it. It is referred to as "the twin brother of the Alhambra" and the truth is when you've been to both you realize that they really are identical, albeit with different feels. The walls, the plasterwork, the different mosaics on the walls, the scriptures (being that animal representation was and still is prohibited), the praise to Allah the Great, the coffered ceilings, the different floors, the arches, etc. . It's a long list of spots, corners, of work in every small point, one really loses track of time and travels back to that period. To walk, trek or stroll through Seville is to be captivated with all that one hears and sees, it is to relate to all these Mudejar buildings that can also be distinguished in some antique Hispanic American buildings. The year was 913 and Al Rahman III ordered the construction of a palace fortress. The Alcazar is formed by a set of palaces that make up the most polished display of Seville architecture, nestled in the old city. In it one can discover beautiful gardens, with rooms and courtyards built by Moorish craftsmen, and that stand out for being typically unmistakeable. What sets it apart from other buildings is the intimacy of the complex that combines and mixes artistic styles as beautiful and as different as the Gothic, Renaissance and Baroque. Combined with a dive into its colorful gardens and labyrinths, makes you forget about the city outside and brings you to a timeless universe. 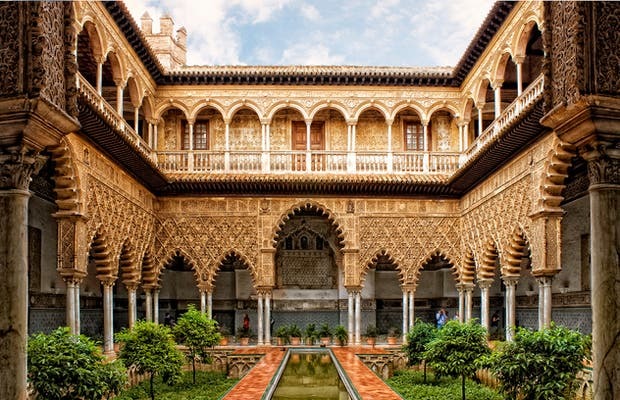 The Real Alcazar is one of the most outstanding buildings in the world. The place to visit in Sevilla! This place is beautiful and full of history. It's better to buy the ticket online before to avoid waiting hours.